Daddy and Harper watching Mickey Mouse while we waited for the doctor and nurses to come by and talk to her before surgery. She was such a trooper and even though it really was a MINOR surgery - I didn't get sad or nervous - I had a peace so thank you for praying. The anesthesiologist was talking to us about all these medical terms and right in the middle of that - Harper looked at him and blew a huge raspberry as if to say "who cares?" We all got tickled. She is such a mess. Harper talking to her grandparents on the phone before they took her back. The doctor told us she was quite a charmer during the surgery and recovery and never cried once! She only cried when they brought her back to us and she saw me. I guess she remembered that she was hungry and missed me. ha! The surgery was quick and went great! We came home and she had a snack of peach puffs and some new peach yogurt melts! 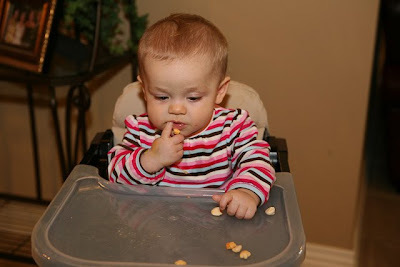 Ever since we ate lunch with Brody on Monday - she has become an expert at getting her snacks into her mouth - and FAST! I was surprised this morning that she only weighs 18 pounds because she can put some food away! She is taking what will hopefully be a long nap today and I'm about to join her. We are so thankful for God taking care of her but my heart is so broken still for all the children who are sick. I know there are many adults to pray for also but I just know it is so hard to watch your child be sick. I updated over on my left sidebar the sites of children who could use your prayers and there are many more on the prayer blog. Please continue to lift them and especially their parents up today! We prayed that God would give us a healthy child with ten fingers and ten toes and He decided to give us extra blessings! We praise Him for that! I will miss her sweet little toe but I'm sure she will thank me one day when she's a teenager and she will be better able to start walking now! (But there is NO hurry on that one!) ha! So glad your sweet girl's surgery went well. They really should have pink hospital gowns! So glad Harper's surgery went well, such a sweet baby girl! I am so glad that everything went so well. Minor or not, having your child go through a surgical procedure is hard. 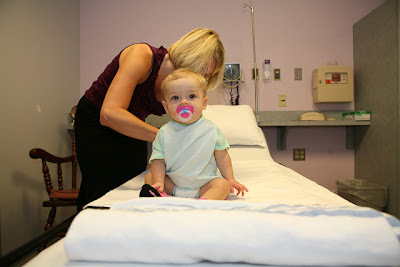 I remember taking my oldest in for ear tubes and I was a wreck. Now he is 10 and I wonder where the time has gone. Give her extra hugs today and a few extra yogurt melts. Aren't those things just the best. My 19 month old LOVES them! SO happy that everything went well for Miss Harper! God is GOOD! Praying for you all today! So glag the procedure went well. Harper is sooooo cute =) Have a great day! P.S. I'm the one who emailed you about a Show Us Your Life topic - to have people post pictures of themselves with somebody famous :) You know you want to see me with Rob Lowe and Melissa Gilbert...LOL Also, my friend has a picture of herself with Rod Stewart. I'm so happy to hear a positive update on Harper's surgery. She is such a precious girl. Praise Jesus! Glad all went well and Harper seems to be doing great! The pictures of her in the hospital bed are so sweet....she looks so little and tiny in them. I am glad you had a peace during the whole procedure. God is good. So happy to hear that everything went well. All surgeries are scary no matter how minor. I've gone through a couple with my boys and hated every minute of it. It certainly does make you more appreciative of their good health and makes you more sympathetic to those children and their parents who have to endure many hospital visits and procedures. I am so happy all went well with Harper's surgery. We will meet with the Orthopedist next month to schedule Ruby's surgery for her toe. I'm not as nervous now thanks to your post. Very happy that everything went well. She is such a blessing to you and I am thankful for her sweet life. Harper will love telling people about her extra toe when she's a big kid. I went to school with a little girl named Evangeline when I was in the third grade and she showed us her newborn pictures with six fingers, and we loved it! Glad she came through her toe-ectomy so well! So glad that all went well. Hope you both get a good nap. Many blessings! God is good! I was praying for you this morning! Have a good nap! So glad things went well, and you are home. I knew Harper would do fine, she's quite the strong little girl. So glad everything went well! We have been praying for her and for you guys too. Praise God for the big and little answers to our prayers!!! I AM SO GLAD THAT SHE DID GOOD! I HOPE SHE HAS A SPEEDY RECOVERY!!!! I didn't realize how much Harper looks like her Daddy until the photo of them watching Mickey Mouse. I am so thankful the surgery went well. So glad to hear that things went well this morning. I think a cute pink bow would have been wonderful for her hospital gown outfit!! Happy napping and have a wonderful day! I've been checking your blog all morning. So happy everything went well. I remember when Jackson had eye surgery when he was just 7. After they took him out of the room I just bawled. It is so nerve racking. Love you all. Kelly, I am so glad everything went perfectly! Thank you for updating us on littles in need of prayer. Prayer is powerful and it's wonderful that we can do that for each other. You guys have a fabulous weekend with healthy little Miss thing!! Glad all is well! She is cute, even in a boring hospital gown! I was wondering if you know the name of the family that had sextuplets in TX and now only have 3 that are still alive. I was following their blog from Jenna's blog, but she took down the link and I have no idea how to find that blog again. I didn't know if it was one of the fmailies listed on your prayer list. So happy Harper's surgery went well!! I have a sweet friend, first time mom too, whose little boy had to have some "boy" surgery this morning too. He just turned 1 yesterday. Thanks for asking us to pray for all babies and mommas. Glad Harper is doing great! I'm so glad everything went well. Surgery is Surgery no matter how minor! So glad little H is doing well... prayed for you guys and hope to come see you next week! PS- Avery says hugs to Harper!!! Praise The Lord for the great report about Harper! CUTE...bow or not! Good to hear everything went well! so glad things went well with Harper's surgery! She looks adorable! So glad everything went beautifully! Harper is so precious and God is good...get some rest! I'm so thankful Harper's surgery went well! My son Ethan has to have surgery for skin tags by his ears because of the risk of infection. It is such an encouragement to know that Harper got through it beautifully by God's grace and now I feel more at ease that Ethan can as well! You continue to amaze me! So glad Harper did well. I've prayed for y'all all day long! So very thankful all went well today and I will be praying for her continued recovery (and yours and Scott's:)) Hope all of you are feeling GREAT again SOON! So glad everything well smoothly, Kelly. 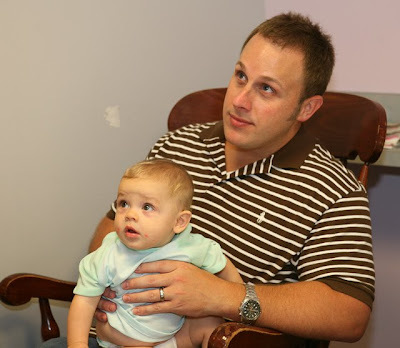 I think Harper looks like her dad in that picture of the two of them waiting for the surgery! Her little fall dress is cute, too. rejoicing that today went smoothly! so thankful and joining you in praying for others today too. adelaide has that same adorable dress that harper wore to surgery. it is special at our house too, because she wore it on her very first day of mother's day out (school) this year! So glad everything went good. Harper is a trooper (mom and dad too). Here is someone else in need of prayers. Melanie is so inspirational. So glad that Harper did so well. I am sure you are relieved to have it over with. My little girl had a procedure last Wednesday. It was scary for us even though our older daughter had the same procedure only six months prior. We are now facing the strong possibility of BOTH of our daughters needing the same major surgery. We are a bit overwhelmed at the thought. The doctors even recommended both of them having it at the same time (I don't think this momma could handle that). of them having surgery at the same time We could definitely use pray for them. I am so glad to hear that surgery went smoothly! I love how you put it.. an extra toe.. an extra blessing! I always say Owen was born with 1/2 a heart because Heavenly Father just couldn't part with the other half. Owen's surgery went smooth and after a sleepless night in ICU, we are home. My heart just broke for all the other families in the cardiac unit with their babies holding on to life. It's harder when you know exactly what they're going through. You can't help but cry with them. I totally see why they call Harper a "he" when she's around her daddy, cause she's a spittin' image of him!!! Such a blessing for the surgery to be such a success! The picture of Harper with Daddy shows how much they look alike! Praise the Lord that her surgery went fine. That is the most boring children's hospital gown I've ever seen--here in Dallas they at least have little tigers and say "tired little tiger" on them! What a wonderful praise report! Wonderful! I woked up this morning praying for Miss Harper. Does she know what a star she is? Oh, I think so. When she sleeps I'm sure the angels whisper to her how many people just think she is the best. So glad Harper's surgery went well! Thinking and praying for you and your family! praise the Lord that the surgery went so well!!! i may have to head on over to our wal mart and see if they have that sweet dress for my little doll!!! I am so glad to hear that all went well and Miss Harper is doing well. So happy to hear that it all went well. So happy that Harper's surgery went well. Praise the Lord! Way to go Harper, such a little trooper (and mom to :-) those surgeries can sometimes be harder on mom than baby. She is just adorable and the Lord our father has blessed you dearly!!!! So glad the surgery went well- I bought the same dress for my new baby girl a few weeks ago. I thought it would go perfect this winter with brown leggings i got on sale at dillards for $3!! So glad it went well! Thank you for being so brave with this. My daughter has a hemangioma on her finger and the doctors are talking about surgery in a few months, I may be contacting you then for more guidance. Hugs to Harper! So glad to hear it went well!! I know you've taken down your email for a break (believe me, I get it... I just have to read and not respond... so not good), but there's something I'm interested in "talking" to you about... so if you have a second and could email me at momtobabyjonut AT gmail DOT com, I would really appreciate it. Just whenever you get the chance. So glad Harper's surgery went well. Isn't it so great when they cooperate? Besides the vomiting issue, Jonah is really good when we take him out (except church... I know you know that feeling). Anyway, I don't want to write a novel here, but I hope we get to "talk" soon. Thanks for being so "other people centered" and for bringing us all these prayer warriors for Jonah. He amazes me every day, and I know it's a direct result of PRAYER. Hooray for miracles!!! What an answer to prayer, so glad that things went smoothly! I'm a pediatric nurse and at our hospital, we have cute purple hospital gowns for the baby girls, and people still screw it up! Oh well, she is too cute! I am very happy to hear the surgery went well for your sweet girl. so cute. and only harper can rock it in a hospital gown!! Great job Harper! I hope you two have a very restful nap, you totally deserve it after such an early wake up call. Yikes! Thank you, God, for a successful surgery. I'm praying for all children going through surgery today. I am so thankful the surgery was a success!!! She looks precious in all of those pictures...you can see her little personality coming out in them!! So glad that her surgery went well! When our daughter Naia had her tonsils removed last year, we forgot her entire suitcase and had to spend the night in Little Rock, she got a new outfit to wear during surgery. Also, the night before we took her and got a "pedicure" so she would have pretty toes during surgery! Oh, I am so glad everything went well! So glad Harper's surgery went so well. I prayed for God's peace to be with you all, before I went to sleep last night, and said a prayer for all the other sick little ones too. So glad it's done and went well! She is such a sweet heart! So glad to hear everything went well!! I'm so glad Harper's surgery went so well. Those pictures are so cute of her! I love the little WM dress! Glad surgery went well! We have the short sleeve version of that dress from wal-mart! I love their little jersey dresses! So glad that Harper did so well, she looks so cute, even in a johnny :) Praying you both get a goods night rest. What a sweet, sweet spirit you have Kelly! Thanks be to God Harpers' surgery was a success!! She is so precious. Blowing the raspberry... that's hilarious. Glad all went well for your precious little princess. So glad that it went well!! That is such a cute dress! Kelly, you're just as cute as can be! Praising God things went smoothly! Harper is a girl with personality plus that's for sure! It doesn't surprise me at all that she was smiley even AFTER surgery...she is such a doll! I have been reading your blogs for about three months now, and I had to write you today and thank you for sharing the link to Ann's testimony on Focus on the family. It changed my life.. SO glad to hear everything with Harper went well today! I love the new little dress! You are too funny with that last paragraph! Glad to hear everything went well. Love the picture of her in her little gown....too cute! That is the CUTEST picture of her in the gown! Your comment about the the extra blessings was such a sweet way to look at it. Glad Harper is doing well! Your beautiful Harper sure has one amazing story! We are praying for many of the other children too! So glad the surgery went good!! Our little guy Jacob (he's 4 now) had an extra toe by his pinkie toe on his left foot. He had the surgery around 3 months to remove it. I don't know what your specialist said, but ours told us that if his extra toe would have been on or by his big toe, that's usually an indication of a heart condition. God protected Jacob and we are so blessed to have him! Glad to hear all went well!!! I'm so happy to hear that everything went well! She is so sweet! I'm so happy everything went well! I'm so happy it went so well. I do believe she will be very happy with your decision. 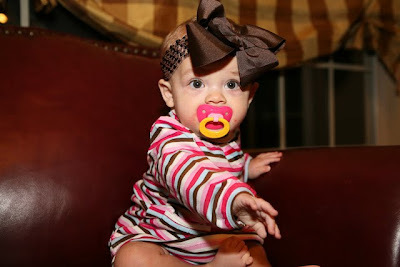 I am so use to see her beautiful bows that I didn't realize how little hair she has. She is so precious. You have one more ANON comment you need to take off on the meeting blog friends post. It was posted on the 15th and is not far from the bottom. Why do these sick and twisted "people" come on blogs and spew their venom? Following Satan-- that's why. I am so glad that the surgery went well. I was praying for Harper, you and Scott today as well as all the other parents with sick babies or those who have lost babies. I thank God everyday for my healthy baby girl. She's so precious in her hospital gown, and I love the pre-procedure dress too :) You are a great mom. So glad everything went well for you guys today. Thanks for sharing. I'm glad things went well!!! SOOO glad it went well!! Thank you Lord! Yay! Thanks for sharing this update! Oh, I forgot this... I just noticed in the first picture of her in her new fall Walmart outfit, you can see her little toe and it's kinda like "a tribute" and the last picture with her sweet toe. So cute! Oh I'm so glad her surgery went perfectly. I was thinking about her today. ;) What a sweet little girl you have!! I'm so happy her surgery went so well!! She is just the cutest little thing!! Thought about sweet Harper all morning. I'm so glad it went well. Sounds like Mom did great too. I must say that as a pediatrician (well...in training!) it REALLY annoys me when other doctors and nurses just randomly talk about a child (who they've BEEN taking care of) as a "he" no matter if the child is a girl or boy. I try my best to pay attention to that and get it correct! Glad Harper's surgery went well...she really is quite a cutie! I'm glad to hear Harper's surgery went well! I'm thankful God was with her and the doctors and all went smoothly. I'm so inspired by your compassionate heart! Thanks for your posts. I'm so glad every thing went well with Harper's surgery today. A few years ago I worked at a daycare and their was a little baby with an extra toe. It formed a little heart shape, it was about the cutest little thing. Your spirit and faith are truly faithful. Thank you for continuing to share through your blogging! I have been following your blog since Harper was born. It's so fun to see her grow. I'm glad the surgery went well. Cool thing...I had the same surgery when I was 6 months old. It's one of the fun facts about me that I use when I play the game "2 Truths and a Lie." Also, I appreciate your love for the SEC and that you chose the Dawgs as your second choice team! Love your blog. Love your heart. Love that you let us follow your life! So happy that Harper's surgery was a breeze for her. Minor or major, surgery is surgery! Yay for Harper! Glad the surgery went well! Praise Be that Harper's surgery went well. I know you can heave a big sigh of relief. Her hair is getting long. Isn't it the softest thing ever. Hope you and Scott are feeling better. She sure was bright eyed this morning. Looks just like her daddy in that one picture. she is precious. glad surgery went well. Glad it all went well. I love reading about precious Harper. Thanks for being so honest and open about motherhood. So glad to hear that the surgery went well! On another note, I wanted to give you a little warning. My twins, B&B LOVE yogurt puffs and I have discovered that the peach ones STAIN everything, so be careful. Don't want any of Little Miss Harper's clothes! Again, glad to hear that Harper was such a big girl today and that the surgery went well! I'm so glad it went well! My little guy had another set of tests at the hospital today and for the first time in over a year, we finally got some good news! Our issues are not-so-big either when you compare to others but when it's your baby, it's always difficult. SO glad that everyone is doing well! So glad everything went well with her surgery and she's home and doing great!! She's a beautiful baby!! Yes, thank you for posting that link today. I was at work and listened to it, and it made me cry, too! But such an uplifting story!! Oh my goodness!!! Thank you!! I'm so thankful it went well! I laughed about the bow comment. So thankful that Harper's surgery went well! she has the sweetest little looks! i know you could eat her up. i prayed for her every time i woke up last night (which was frequently unfortunately). i'm so glad it all went well. Praise the Lord for a successful surgery! I love the new striped dress you got her from Wal-Mart! I'm so glad to hear that Harper's surgery went so smoothly. And I'm tears right now because you've included the link to a longtime friend's Caring Bridge page for her son-Walker Rainey. Missy and her family are such prayer warriors, but it's so wonderful to see that you've included them on your site! Now even more people will learn his story and will be blessed by the journey that they're on. Bless you Kelly. Aww, sweet love...Harper is just precious! I am so happy to hear things went well...I've been praying! HUGS! Glad to hear she's doing well!! I'm so glad to hear everything went well! Praise God! Yay! I am so glad and thankful that everything went super great and easy! Oh I am so glad all is well...she is such a little angel. I'm glad everything went well. It makes me feel better about my son's upcoming surgery. I think we're going to wait a while too, probably when he's between 9-12 mo. Look at her feeling great afterwards, how awesome! Glad everything went on well with Harpers surgery. No matter how minor it was it scary regardless. I agree with you no hurry on her to start walking once they do its like they rule the world they are no longer babies they can do it on their own they think they're tough at least JAYSON thinks that. I'm so glad that she did so good! Praying for those sick children with you....it tears at my heart. Its still raining here. Bleh. So happy Harper did so well! Have a great weekend! Glad to hear that the little peanut's surgery went well. My little one LOVES the puffs, but just wont put them in his mouth by himself?!? I hope that he catches on soon...b/c hand feeding them 1 by 1 can be time consuming! SO glad the surgery went welL!! I am so, so glad that everything went so well. Very cute that she blew the raspberry..like "this is a piece of cake after all I've been through".